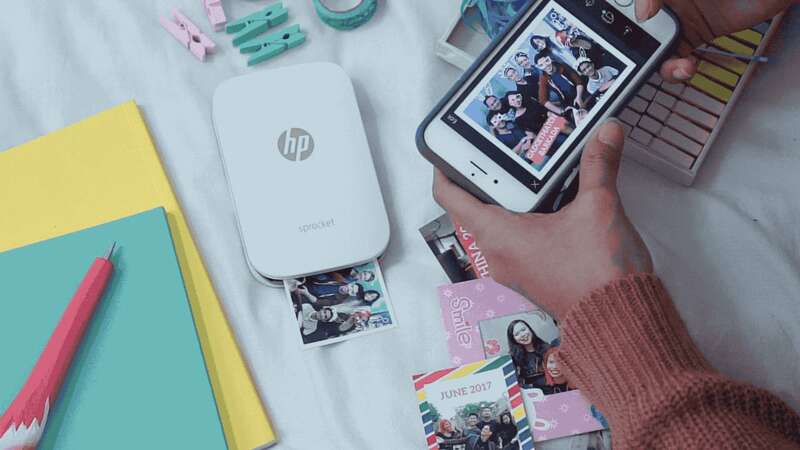 With all of our special moments now on our smartphones, getting one of the best iPhone photo printers is the best way to ensure our favorite memories are remembered. Unless you're a professional photographer or taking one of the best professional online photography classes, more likely than not your photos of graduations, birthdays, parties, family gatherings, and all other important moments are on your iPhone. It makes perfect sense, I know my phone is the only camera I need because it is high-quality and is able to store thousands of pictures—I have a lot of storage thankfully. Since the photo-taking game has changed, the printer game has begun to follow suit. More and more well-known camera/printing companies are creating high-tech iPhone photo printers to go along with this trend. Now you are able to print photos directly from your iPhone but it's important to note that not all of the printers that have these capabilities are worth purchasing. Some don't have enough features, some are too expensive, and others are just not worth buying with so many high-end printers available. I have gathered the best deals and printers for you to make your decision, you can't go wrong with any of them, so feel free to choose your favorite. The Selphy CP1200 from Canon comes in either black or white, can come with its own ink cartridge, and is relatively cheap compared to most high-end printers. It has a dedicated button designed for joining Wi-Fi, so you won't have to worry about connectivity issues. Once aligned with the Wi-Fi, printing photos from your Facebook and Instagram is supremely easy. One of the cheaper models you can get, if you don't want to break the bank so early in 2018, this is the one for you. Epson throws its hat in the ring for best iPhone photo printers with their PictureMate PM-400 unit. Only weighing six pounds, this model is lightweight, portable, and can fit in compact spaces. Also embracing the wireless trend, the PM-400 prints directly from phones, tablets, and almost any other smart device that holds pictures and has Bluetooth capabilities. With almost everything have Bluetooth these days, I fully expect you to be able to take, store, and print photos from your ironing board pretty soon, and this printer would be able to do it. Canon has returned! It's not shocking to see them again, as Canon is one of the biggest imaging and optical product creators in the world. Luckily for all of us, they've dedicated a considerable amount of resources to new, top of the line printers. The iP8720 is capable of syncing with multiple operating systems and can be purchased with a slew of ink cartridges for one stop shopping. With a six-color ink system, the end result of your photos will look professionally done; not too shabby Canon. Canon just can't help themselves. The Gods of creating the best iPhone photo printers are at it again with the Selphy CP1300. Yes, it's the newer model of the CP1200 already mentioned, but you'll have to compare the features to know which is the right one for you. The CP1300 boasts water-resistant photographs and weighs only 1.9 pounds. Incredibly portable, this model offers an LCD screen in which you can edit your favorite photos before printing them. An officially recognized Amazon Choice (good quality, price, and shipping options), this may just beat out its earlier version, but it's an extremely close race. The Fujifilm Instax Share SP-2 is the second certified Amazon Choice we have come across and it's no surprise why. It is portable (7.1 x 5 x 3 inches, 8.6 ounces), produces high-resolution photographs (800x600 dots and a print resolution of 320 dpi), and even comes with a rechargeable battery that can be hooked up to a micro USB port. It's hard to picture a printer fitting in your pocket while still producing excellent, instant photos but here we are. God, I love technology. With the size of the Sprocket by HP being roughly similar to that of your of iPhone(! ), this printer is far and away the most portable one you could hope to find. Weighing an absurd 6.1 ounces(!! ), this is the perfect unit for those who like to travel frequently and take countless pictures. Available in six stylish colors, the Sprocket prints 2x3 snapshots of every moment you would like to catalog in a scrapbook, journal, or just to keep in your wallet/purse. If you are really motivated to capture unique moments, download the Sprocket app to add filters, borders, and emojis to every picture. It's the Snapchat of portable iPhone photo printers. While not having the portability of the previous two printers, the ENVY 5055 from HP offers features the smaller models can't match. Some examples include scanning documents, automatic two-sided printing (saving you paper), and my personal favorite, the option to buy and have ink delivered through the ENVY 5055 for as little as $2.99 per month. HP also provides some pretty nice perks. You can contact them at any time due to their completely free, 24/7 web support if you have any questions. If the worst should happen and your printer decides to stop working all of the sudden, this unit comes with a one-year warranty. HP is not messing around. Another one of the best iPhone photo printers from Epson, the Expression Photo XP-15000 is a tad bit pricier than most other printers but it is more than worth the price tag. It's built with a 50-sheet rear tray for specialty media, supports two-sided document printing, and can hold 200 sheets of paper in its tray. It may look bulkier than most of the other printers but it can easily fit on your desk or in other tiny spaces. You will still be able to print photos from all of your social media accounts and devices but now they can be even more memorable! How you ask? It's because the XP-15000 can produce images with borders of 13" x 19" or 4" x 6". Not many printers give you the option of those two distinct sizes. We are back to the pocket-sized printers! The technology capable of making printers so efficient and compact continues to astonish me. The ZIP from Polaroid is not just a great model but it also comes with a wrist strap, a micro USB cord and a ten-pack of Polaroid Zink zero ink paper. Don't let all the additional perks fool you though, the ZIP still produces high-quality photos. The 2x3 shots are smudge-proof and come on peel-back, sticky paper. The sleek design is what draws my eye though, and I think it would be perfect in red. With all the major imaging companies creating portable iPhone photo printers, Kodak did not want to be left behind. The conveniently built dock not only holds your phone to print but it charges it simultaneously. With how often people use their phones these days—myself included—we could all use another power source to keep our devices on. Similar to the Sprocket from HP, Kodak offers an app for this printer, giving you the ability to add filters, stickers, card templates, a collage maker, etc. With all the great features and deals available above, you'll just have to choose the one you believe suits you best. Investing in one of these has two major benefits; it keeps your memories and moments alive and printing your photos makes you a better photographer. That sounds like a perfect win-win scenario to me.